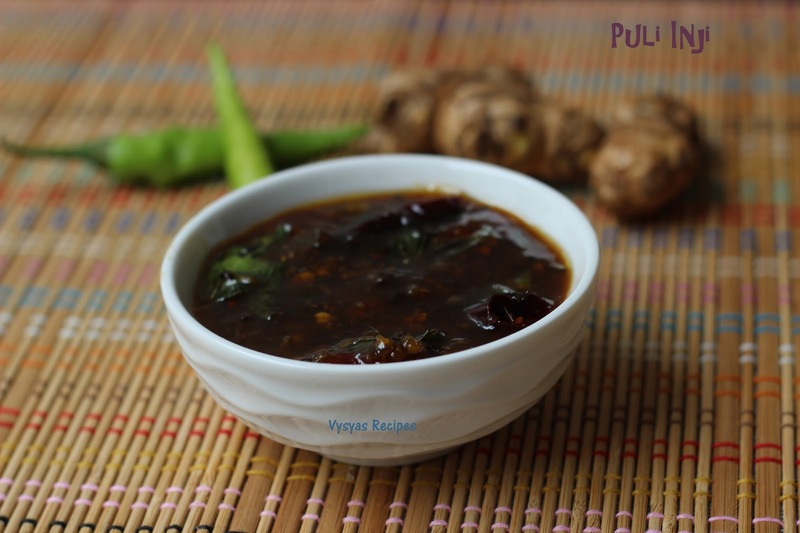 Puli Inji is a dark brown tangy curry made with Ginger, Green chillies & jaggery. It is mainly Prepared during Sadya's, & no feast ends without Puli Inji. Puli Inji is served Mainly for Digestion. Puli Inji has a combination of tangy, Spicy & sweetness taste, which makes the curry so delicious. This Ginger pickle is an accompaniment for Rice, & also goes well with Pongal Recipe. My MIL makes this mainly for Pongal. I am a big fan of this Puli Inji. Now we will see the Preparation. Cook Time : 12 minutes. Sesame oil - 3 tbsp. Fenugreek seeds/ Methi seeds - 1/4 tsp. Soak the tamarind in water for 1/2 an hour, then squeeze the tamarind Pulp, discard the Pulp & reserve the water. Peel the skin of Ginger & chop the Ginger finely. Dry Roast the Methi seeds & Powder it. Heat a tsp of oil, add chopped Ginger, Saute till you get Good smell from Ginger. Then remove it & dry grind it, into a fine Paste. Heat the Remaining oil, add mustard seeds when it splutters add broken Red chillies,Curry leaves hing & Green chillies. When Green chillies, turns the colour add tamarind water, when it starts boiling, add Ground Ginger & Grated Jaggery. Cook in simmer mode, till the gravy becomes thick , & it oozes the oil from Gravy.Finally add Methi seeds Powder & give a quick Mix. Allow it to cool & store it in a clean dry bottle. Always i prefer to Grind the Ginger, so it won't come in mouth. Adjust the chillies according to your spice level. if you find debris in jaggery. melt it & filter it, before using. Puli inji thickens after it cools down, so switch off accordingly. you can store it in a clean dry bottle & Refrigerate. Puli inj is my all time favorite recipe. Looking absolutely delicious and perfectly made.